Every summer, I try to spend as many days as possible on the beach at Enoshima, and each time I get out of the station and walk towards the sand, I pass a long line of people waiting for a seat at the local pancake restaurant. This isn’t Japan’s only pancake joint with a lengthy wait, either, as you can find similar eateries with comparable lines in Tokyo, too. It used to strike me as a little weird. After all, whipping up a stack of pancakes isn’t exactly the most challenging culinary feat. It can get tedious, though, as you settle into a monotonous pattern of plopping batter into the pan, flipping the half-cooked cake, and repeating over and over again. Or, you could bypass all that by making an entire batch of pancakes all at once in a rice cooker. Yes, it turns out the most ubiquitous of Japanese kitchen appliances can in fact be used to help you cook a classic American breakfast. But while the flavor of rice cooker pancakes may be traditional, their appearance is anything but. If you’re familiar with electric rice cookers, you know their major appeal is that the cooking process in entirely automated. The same goes for using them to make pancakes, and once you’ve done the prep work, you can leave the rest up to the machine. 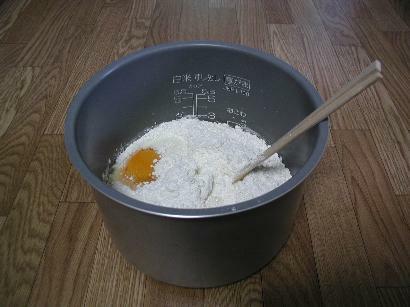 To start, simply toss your pancake mix and any other ingredients it calls for into the rice cooker’s pot. Next, stir everything together until it reaches a uniform consistency. After that, hit the start button, and your role is done. As with making a pot of rice, the pancake should take about 45 minutes to cook. Once the process is complete, flip open the lid and claim your delicious prize. First-timers should be careful not to fill the pot too high, though. Doing so can cause the top of the cake to fuse with the lid, making it difficult to open. Also, trying to cook too much at once can leave the pancake’s core gooey, although this can be salvaged with some time in the microwave. As you can see, making a whole batch as a single solid block results in an incredibly thick pancake. It can also end up having a pretty large diameter, depending on the size of the rice cooker you use. Efficiency experts have probably already picked up on one of the hidden benefits of this method: less stuff to wash. With the orthodox way of cooking pancakes, you have to mix the batter in a bowl using a spoon, pour it into a frying pan, and then turn the cakes with a spatula, and all those utensils need to be cleaned afterwards. With a rice cooker, all you’ve got to wash are the pot and mixing spoon. Rice cooker pancakes aren’t just great for lazy people, either. Some inventive gourmands have spruced theirs up by adding special ingredients, such as chunks of chocolate and sliced bananas. Sweeter still is this cake made with cocoa powder. You can also go the Japanese dessert route, by adding sweet black beans. This creative chef decided to pre-sweeten his pancakes by adding maple syrup to the batter, along with brown sugar and sweet potato. Cheesecake fans might also want to try combining the pancake mix with cream cheese, sugar, and lemon juice. Or, if you’re looking for a healthy meal instead of a sweet indulgence, you could fortify your batter with potato and okra. As tempting as these all look, though, the single greatest advantage to making your pancakes this way isn’t the flavor, but the ability it gives you to enjoy a hot meal as soon as you wake up. All rice cookers have timers and a function where low heat is used to keep the rice warm after it’s finished cooking. Mix your batter the night before, hit the start button just before you go to bed, and come morning, you can be enjoying your fluffy pancakes almost before your eyes are completely open. Stomach rumbling? Mouth watering? How do Japanese-style matcha rice-cooker pancakes sound? Check out our super simple, super tasty recipe here. Japanese pancake artist offers new batch of amazingly edible pancake character art! Pancake cafe from Fukuoka comes to Tokyo — and we love their divinely fluffy pancakes!